Heat oven to 350°F. Cut 4 (18x18-inch) sheets of heavy-duty foil. Place 1 fillet on center of each sheet. Top each with 1/4 each of the onion, salsa, roasted red peppers, olives, olive oil, nopales and black pepper. Wrap packets securely using double-fold seals, leaving a small opening so steam can escape during baking. Bake 30 to 35 minutes or until fish flakes easily with fork. Sprinkle with cilantro. 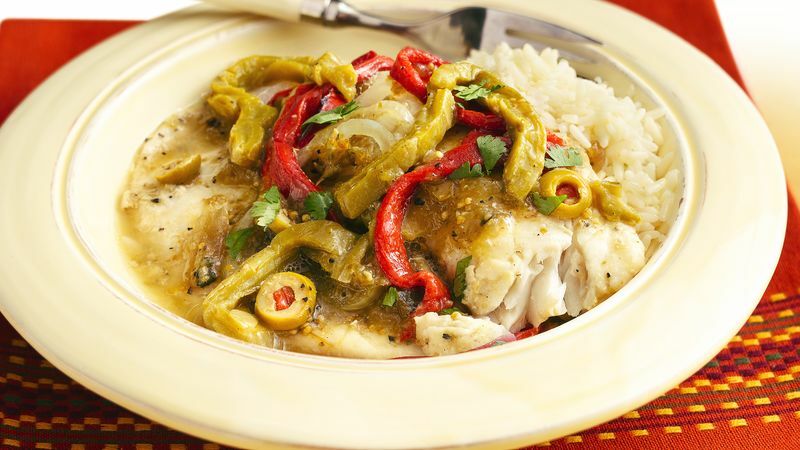 Prevent fish from drying out by cooking it with salsa, roasted red peppers and nopales in a foil packet. Nopales are the fleshy oval leaves, or pads, of the prickly pear cactus. They taste slightly tart. Look for cans of nopales in the Mexican section of your supermarket. When cooked, the lean white flesh of the tilapia is sweet, mild, tender and has no "fishy" flavor. The tilapia at your market may be from a fish farm in this country or from the fresh waters of Colombia or Costa Rica.